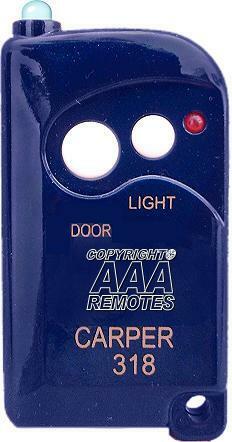 Welcome to our Carper universal garage door opener remote page. Carper is an after-market company that designs excellent replacement remotes (transmitters) that are made to work with the most popular garage opener models from Genie, BlueMax, Allister, Pulsar, Allstar, Linear (Delta 3 system), Multicode, Multi Elmac, Ambassador, Heddolf, Automatic Doorman, Moore-O-matic, PowerLift, Shima, Vemco, X10 and Lift-a-Door. All of the items below have past stringent testing from us and are ALL superior in quality and range, as compared to the original manufacturer’s products! In addition, Carper remotes all include a small built-in flashlight… never fumble in the dark anymore when the Carper garage opener remote control transmitter is attached to your keychain!